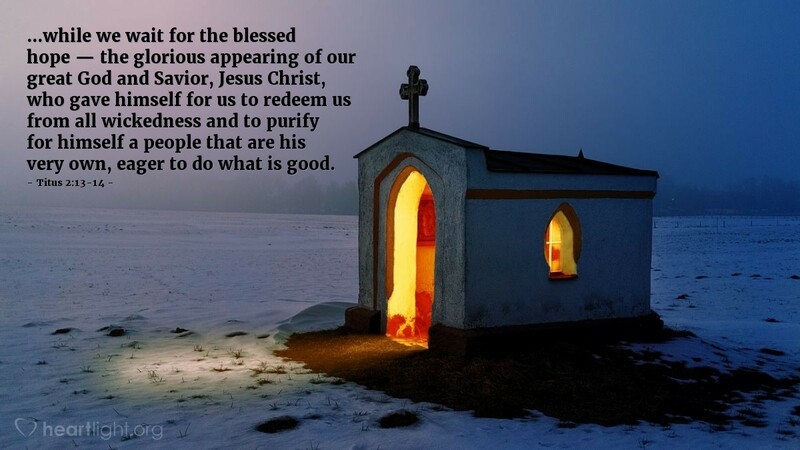 ...while we wait for the blessed hope — the glorious appearing of our great God and Savior, Jesus Christ, who gave himself for us to redeem us from all wickedness and to purify for himself a people that are his very own, eager to do what is good. Some of the most basic and elevated statements about Jesus are made in 1 & 2 Timothy and Titus. These letters are devoted to help ministers mature churches in difficult places. They are incredibly practical, but also are rooted in the work of Jesus, his divinity, and his faithfulness. We are waiting for the Faithful One! We trust that he will come for us because of what he sacrificed to redeem us. While we wait, we honor his mission by being a people eager to do what is good, showing in our lives that he is our Lord. O God, I find myself waiting for Jesus. Because he is coming for me, I know my life has direction and meaning even on those days that are long, hard, and seemingly fruitless. Fire my heart to wait longingly for Jesus' glorious appearing and stir my desires to want what is only good and holy. I want to see you! But, dear Lord, I also long to be like you! In the glorious name of Jesus I pray. Amen.